6733 80IWN 10 Pfg. 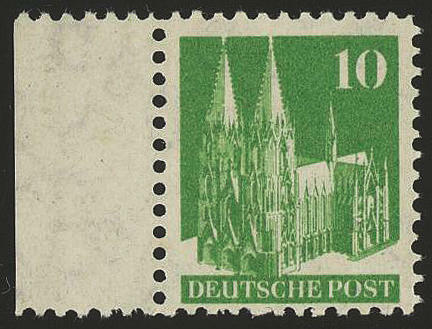 Buildings, type I, watermark W, perforated L11:11 1 / 2:11:11, fresh colors from left margin of sheet, in perfect condition mint never hinged, rare, expertized study group / buildings, Solomon. 6734 80IXB 10 Pfg. 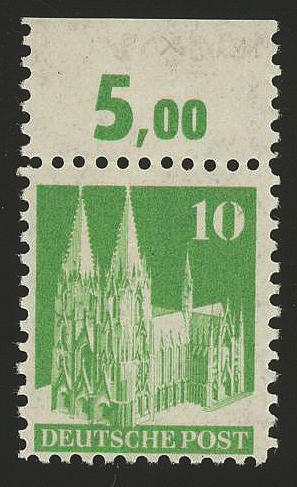 Buildings, watermark X, perforated L11, from upper margin, in perfect condition mint never hinged, expertized Dr. Wittmann. Michel 1000,- €. 6735 ✉ 80U 10 Pfg. 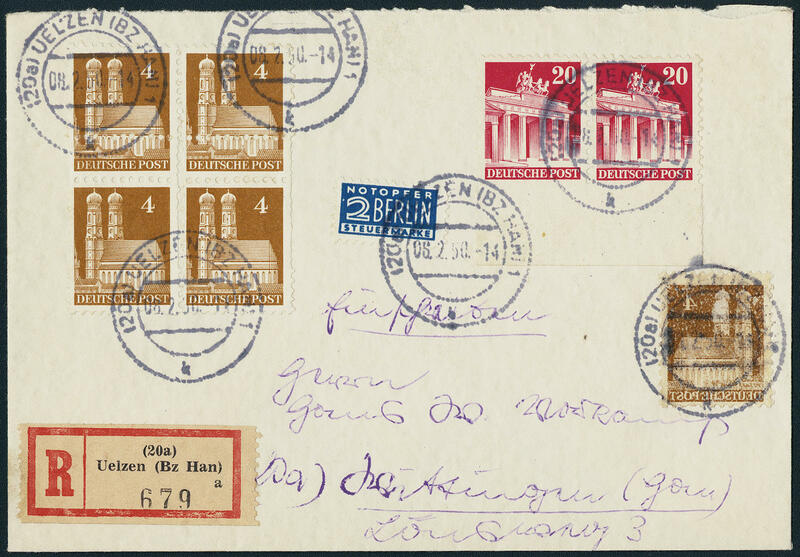 Buildings, four sides unperforated, horizontal pair, in perfect condition on correctly franked cover from \"Brunswick 17.10.49\" to Berlin-Tempelhof. Rare! 6736 ✉ 80U,92wgUu 10 Pfg. Buildings four sides unperforated and 50 Pfg. 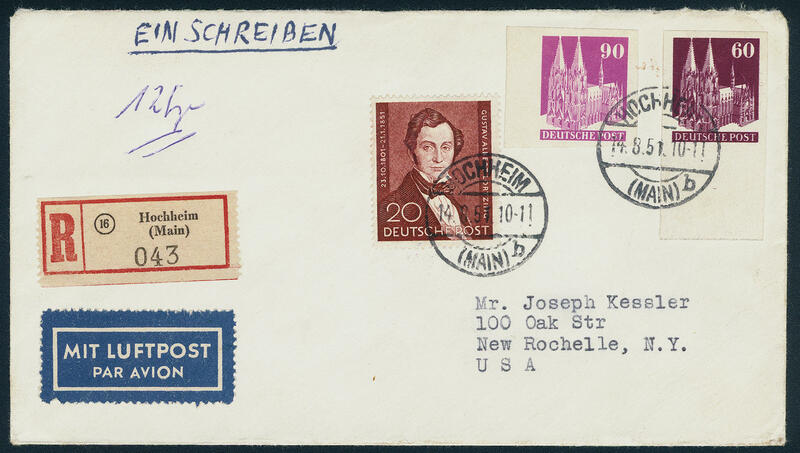 Buildings wide perforated at the bottom unperforated from lower margin, in perfect condition on very nice correctly franked registered cover from \"DÜSSELDORF\" to Velbert with arrival postmark. In this kind very decorative and extraordinarily rare! 6737 ✉ 85wgUu 20 Pfg. 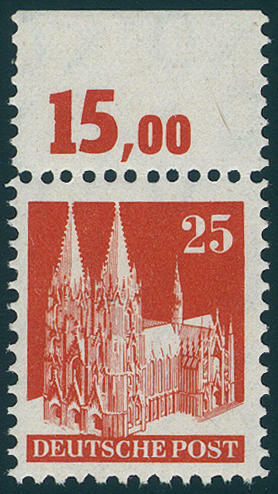 Buildings coarsely perforated, horizontal pair from lower margin at the bottom unperforated, 4 Pfg. 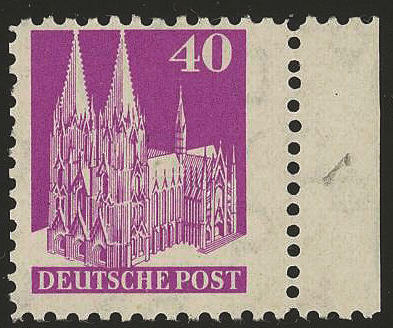 Block of four with vertical diamond double perforation, as well 4 Pfg. 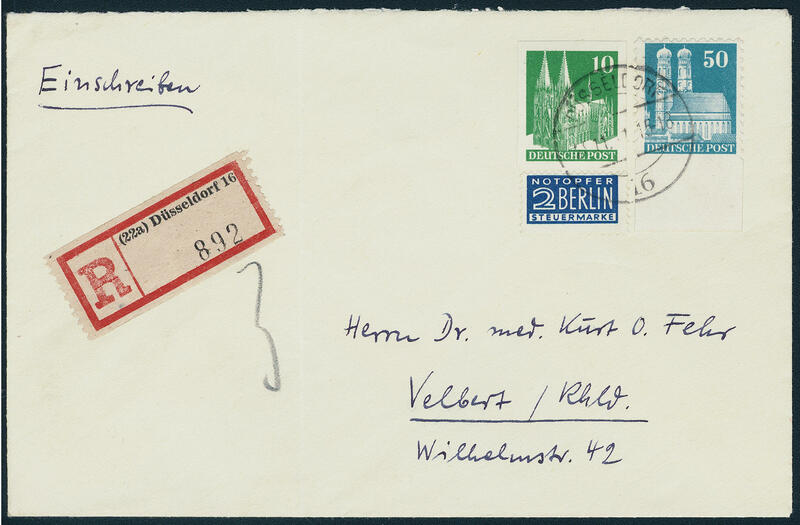 With offset on decorative, correctly franked registered cover from \"UELZEN 8.2.50. 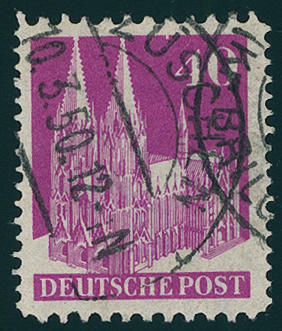 \" to Wittingen with arrival postmark. A magnificent varieties franking! 6738 85XBUuHAN 20 Pfg. 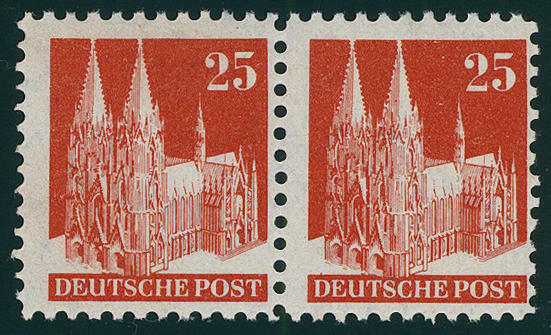 Buildings, block of four from lower margin at the bottom unperforated with house order number \"3254\" in stamp color printed in manuscript, in perfect condition mint never hinged, upper pair tiny gum creases and somewhat irregularly perforated. Extremely rare! 6739 ⊙ 85YA 20 Pfg. Buildings, watermark 1 Y, perforated K14:14 1 / 4, tiny irregular perforated, neat cancelled (came for examination too late, these can to the auction at cost of the buyer through us occasioned become). Michel 1500,- €. 6740 ⊙ 85ZB,85ZF 20 Pfg. 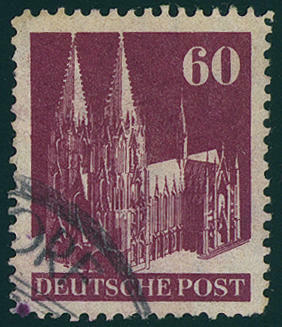 Buildings, two scarce perforations neat cancelled, perforation not perfect, the scarce variety 85 empty spaces with ornaments, between stamps. Twice signed Dr. Wittmann. Michel 1500,- €. 6741 ⊙ 85ZF 20 Pfg. 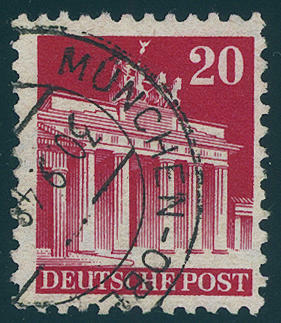 Buildings, watermark 1 X, perforated K11 1 / 4:11, fresh colors, wrinkled crease, well perforated and neat cancelled \"Munich OBERMENZING 30.9.48. \". A very attractive copy this buildings rarity, the only in few copies have become known is. By Michel clearly undervalued! Expertized Novak BPP, photo expertize Stemmler BPP. 6742 87IIWC 25 Pfg. 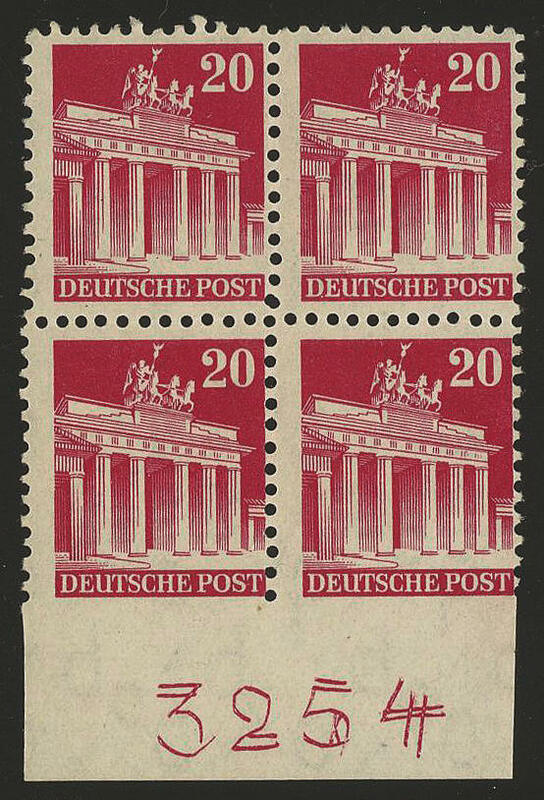 Orange red, type II, watermark 1 W, perforated L11 1 / 2, fresh colors and very well perforated from upper margin, in perfect condition mint never hinged, without any signs. 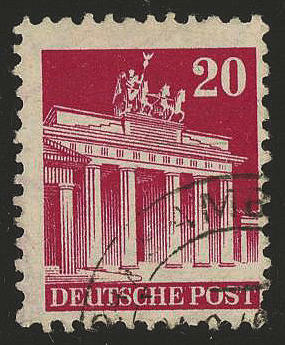 The rarest perforation of this stamp and in this excellent quality hardly ever offered! Certificate (copy) for former block of four \"genuine and immaculate\" Novak BPP. 6743 87IIWP/WB 25 Pfg. Buildings, horizontal pair, type II, watermark W, left stamp with rare one-sided mixed perforation \"L11:11:11:11 1 / 2\", right stamp with the lines perforation L11, in perfect condition mint never hinged, a very nice unit, expertized Solomon BPP, photo expertize Novak BPP. 6744 90aIa/Ib 40 Pfg. 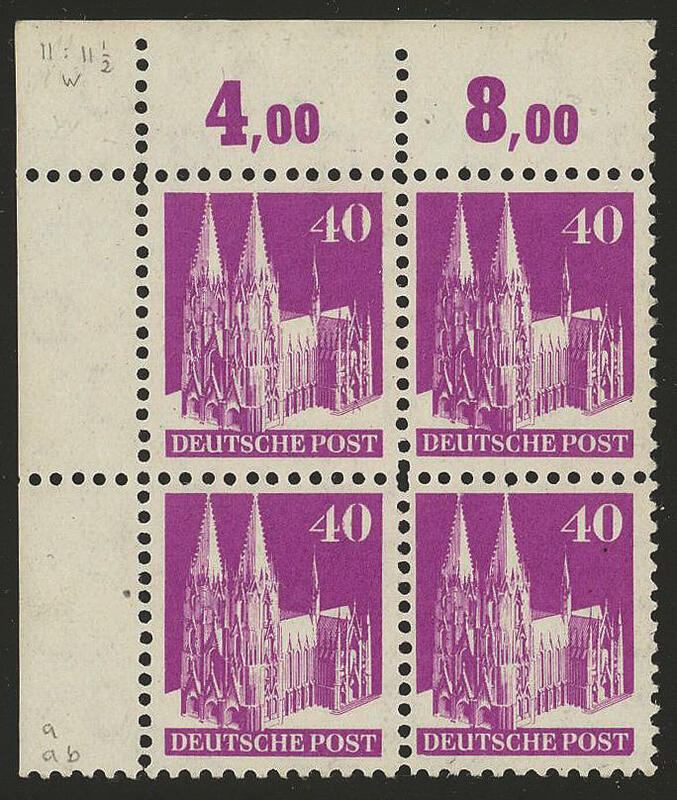 Buildings, watermark W, perforated L11, corner margin block of four top left with the types I, Ia and Ib, in perfect condition mint never hinged with photo certificate Stemmler BPP. 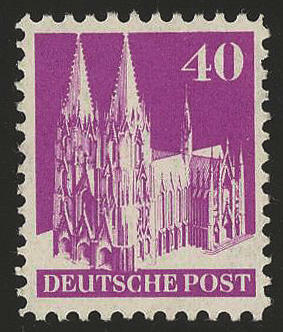 In addition to it another corner margin block of four top left in vivid purple purple with same types combination. Michel 1656,- €. 6745 90aIAWB 40 Pfg. Buildings, type Ia, watermark W, perforated L11, left upper corner of the sheet, in perfect condition mint never hinged photo expertize for former pair Novak BPP. 6746 ⊙ 90bIIIWK 40 Pfg. 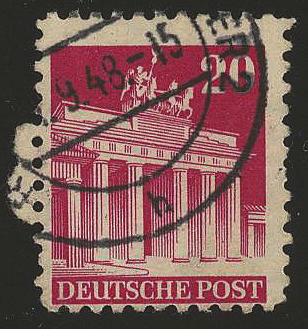 Buildings, type III, watermark W, scarce mixed perforation L11 1 / 2:14, neat cancelled \"ZÜSCHEN 10.3.50. \", very rare offered, especially in faultless quality, photo expertize \"genuine and immaculate\" Novak BPP. 6747 90IbWD 40 Pfg. Buildings, type Ib, watermark 1 W, perforated L11:11 1 / 2, fresh colors and in perfect condition mint never hinged, expertized study group buildings, Novak BPP. 6748 90IIIWD 40 Pfg. 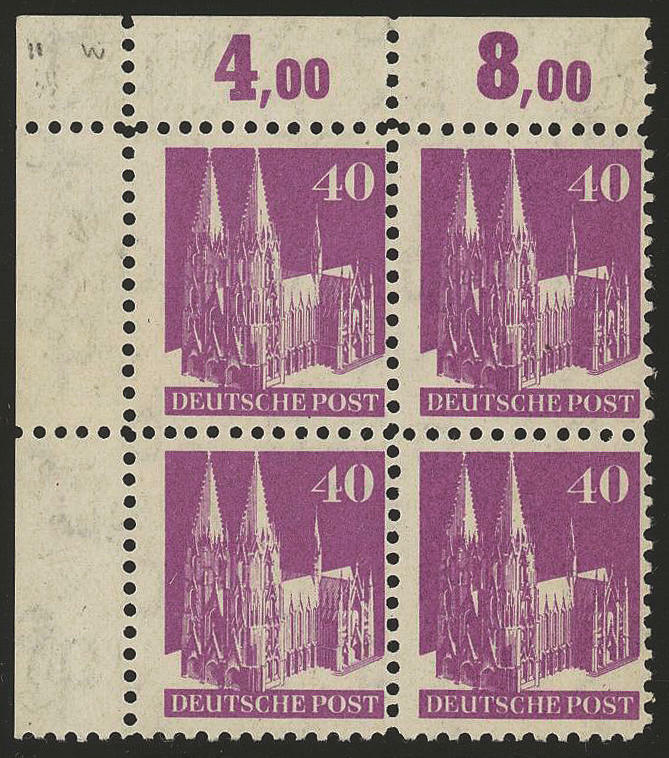 Buildings, type III, watermark W, perforated L11:11 1 / 2, from right margin of sheet springing, in perfect condition mint never hinged, expertized Solomon BPP. Michel 1500,- €. 6749 ✉ 90WEIIUS 40 Pfg. 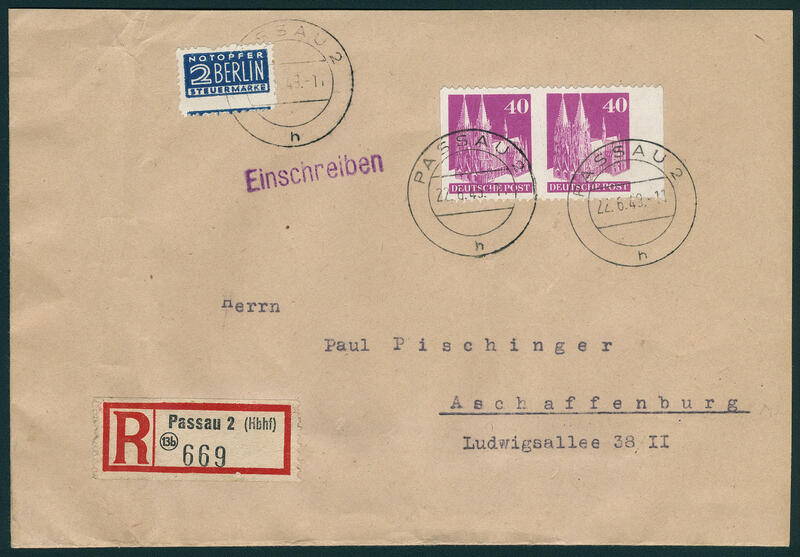 Buildings wide perforated, horizontal pair vertical unperforated on very nice correctly franked registered cover from \"PASSAU 22.6.49\" to Aschaffenburg with arrival postmark. Very rare! 6750 90WUIIIZW 60 Pfg. 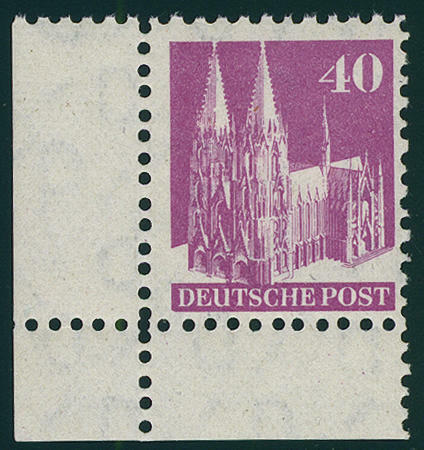 Buildings, horizontal gutter pair unperforated, large margins all around, in perfect condition mint never hinged, without any signs. A decorative unit, from the spoilage springing. 6751 ⊙ 93IXG 60 Pfg. Buildings, watermark X, type I, perforated L14, small faults, used a scarce issue! Photo expertize Novak BPP. 6752 ✉ 93U,96U 60 Pfg. And 90 Pfg. 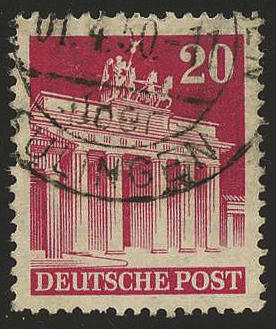 Buildings, both four sides unperforated from margin of sheet, in perfect condition with additional franking Berlin 20 Pfg. Lortzing on registered air mail letter from \"HOCHHEIM 14.8.51. 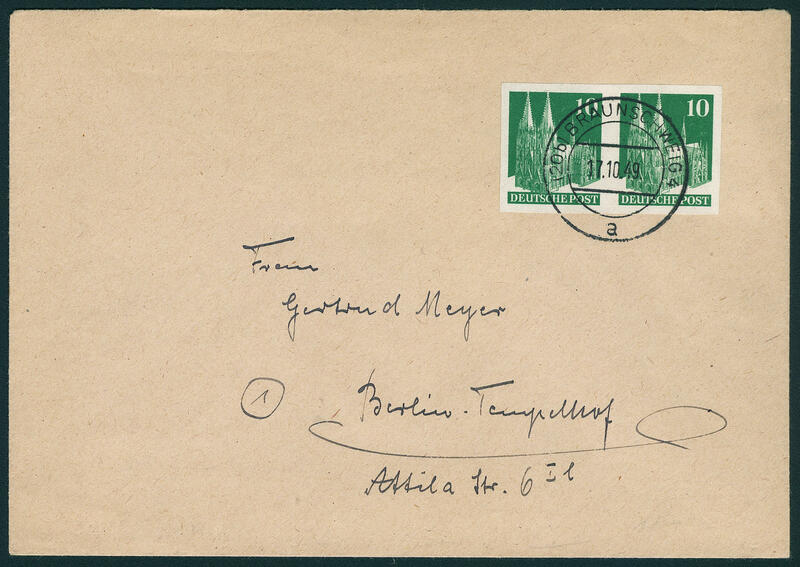 \" to New Rochelle with arrival postmark. In this kind especially decorative and rare!